Having been a CTC member for more than a year, I’ve recently also joined London’s Cycling campaign (LCC) which boasts to be “largest urban cycling organisation in the world”. I hugely admire their work. 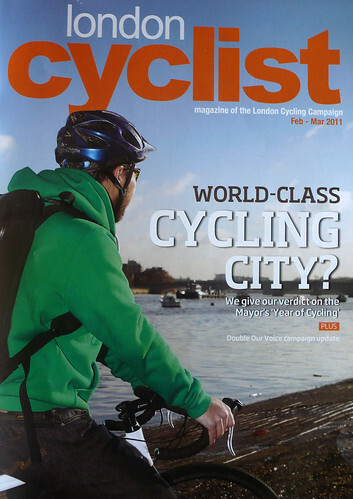 A few days ago, my first issue of the LCC magazine “London Cyclist” arrived (issue February/March 2011 – not to be confused with the great “London Cyclist” blog) In general, it’s really an impressive, professionally made product. However, the bike review on page 42/43 really is a shame. My dear colleagues are discussing “‘urban cross’ bikes”. I don’t have a clue what “urban cross” stands for and “London Cyclist” doesn’t bother to explain it to me. “Genesis Day01 Alfine” (£ 999,99), “Jamis Bosanova” (£ 700), “Kona Honky Inc” (£ 1199,99) and “Marin Toscana” (£999). When I was searching for the bikes on the internet, I was a little bit surprised. For the first three bikes, the Evans bike online shop is among the top search results on Google, and for “Marin Toscana cycle” Cycle Surgery is ranked very high. Pure chance, certainly. Important advertisers like leading national bike retailers don’t have any influence on the contents of a non for profit magazine run by a cyclists organisation, do they? But let’s look at the bikes themselves. All of them have drop bars. Two (the Bosanova and the Honky) come with very small tyres (28 mm). The tyres of the Toscana are 4mm wider, while the Day01 has 35mm. Only one of the bikes comes with mudgards. None has rack or a hub-dynamo and lights. Apparently, “urban cross” bikes are road bikes with disk brakes.